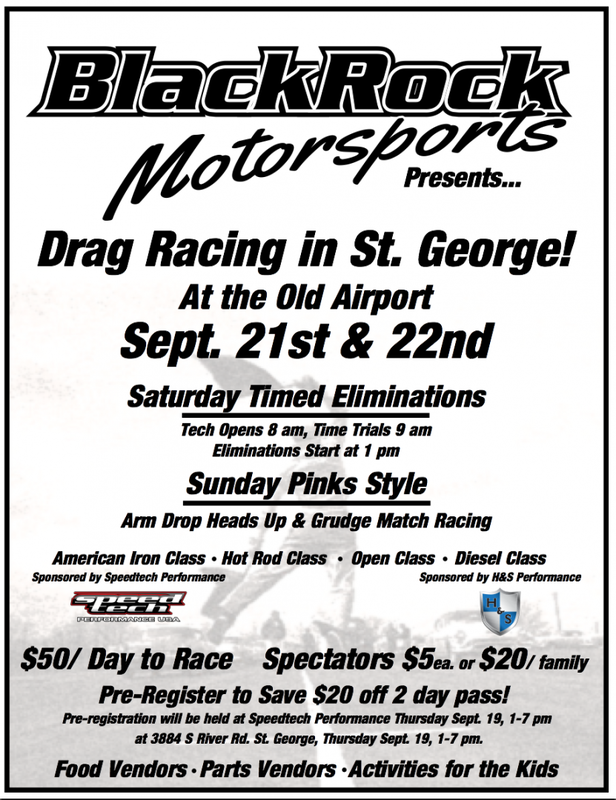 ST. GEORGE – The drag races are back, open to spectators and participants this weekend up at the old airport in St. George. The races, planned by BlackRock Motorsports, will take place Saturday and Sunday with tech inspection at 7:30 a.m. and races starting at 9 a.m.
Saturday’s racing will include timed eliminations using a “pro-style tree.” For those not familiar with drag racing, the “tree” is the yellow, green and red lights used to start a race. Sunday’s racing will include the old school “arm drop” just like the pros did back in the 1950s, featuring heads-up racing and grudge matches. A “time only” secession is planned for Sunday afternoon –a “test and tune,” that is, drivers’ opportunity to see how fast their car really is. There will be classes for American iron, hot rod, diesels, open, and motorcycles (contingent on sufficient entries to race). This is a high fun-potential event for the whole family. Along with the drag racing, food will be offered by Staheli Catering and A-1 Party Rentals will have plenty of things to entertain the kids, and parts vendors will exhibit their wares. You do not have to be a race car driver or have a race car to enter. New cars, old cars, SUVs, minivans, motorcycles. Admission to race is $50 / day, to watch is $5 per person or $20 per family. Well, I wonder just how long it will be before a bunch of “whiny neighbors,” start to complain about the noise from this. . . If they were able to deal with the airplanes flying overhead for decades then I believe they can handle two days of some drag races. Totally cool; about time that old air strip was used for something – and reasonable prices to boot! (Though I’m sure that will get taken care of by the food vendor gouging). Are there bleachers set up, or is it a bring your lawn chairs type thing? $50 to race? It was only $15 back at my local track in N.CA. I wonder if the high fee is due to most of it going to prizes. Hope so. Dumb question but does the race on Sunday start at 9am as well? There was a drag strip installed at the fair grounds, with an area set aside for a grandstand. It’s a nice strip, already built…why are they using the old airport? Length? Is the fair grounds project dead now? Wow, I use to race at the Old Old airport in the 60’s and 70’s! Is it a full quarter? on an 1/8 mile? Love the Pro Tree, glad your doing that, will it be four tenths or five tenths? To get there, you just turn up the same road that used to go to the airport on Bluff street? And, for the guy that thinks $50 bucks is a lot, most the races we enter in Las Vegas are $200 and up depending on the punch card for test and tune. $50 is a bargain! Thanks for the opportunity to go racing again without the drive to Bakersfield or Fontana!